Via the sub-label Unsound Recordings, Unrest Productions have signing yet another new and strong project to the roster, this time being Serration from Detroit, Michigan (based on information listed on Bandcamp). 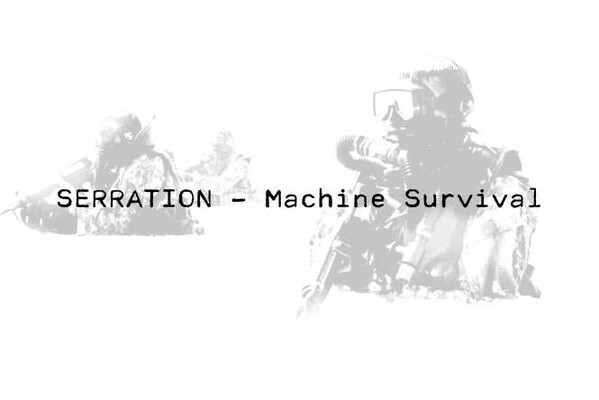 Seven tracks of focused and controlled industrial/ power electronics tracks feature on Machine Survival, ranging from three to six minutes each. Looped distortion and grinding drones are used in relatively straight forward formations, while the vocals as perhaps expected are processed into a layer of echoed distortion that bleeds across the middle of the sonic spectrum. The mood of the tape broadly one of ominous dread than overt aggression, although the pulsing distortion of Sacrifical Deployment and air raid siren noise of The Inevitable Desolation are certainly tensile and anything but relaxed. Thematically speaking the song titles and imagery allude to a focus on the military/ industrial complex, and while the utilised samples might have provided more context, their message alludes detection due to being buried deep in the mix. If any criticism is to be leveled at this tape, it would be that it aligns too closely with the sound, feel and direction of other releases on issued on Unsound Recordings/ Unrest Productions. While this does deliver in terms of sound and approach, it perhaps suffers by not having significant differentiating elements to make it stand apart. Yet even with that said, this is a completely minor observation, particularly if both the project ad label continues to maintain this sort of standard. Limitation of 80 copies, so you know what to do. Inade have never been the most prolific of projects, instead opting to seek stunning quality, over potentially mundane quantity. In this content this new album comes nine long years since the last formal full-length, and perhaps it is only a coincidence that the nine gap also reflects the album’s title. But putting such questions aside, The Nine Colours of the Threshold represents only the fourth formal full length issued during Inade’s 27 years of activity, which includes: the debut Alderbaren from 1996; The Crackling of the Annonymous from 2001; and The Incarnation Of The Solar Architects from 2009’s (note: Samadhi State is not a formal full length, nor are any of the live recordings and archive collections). To speak of the arch of Inade’s evolving compositional approach, over the years it has moved from album length soundscapes (i.e. Alderbaren), to more compact individual tracks and on occasion quite song structured compositions (i.e. The Crackling Of The Annonymous and The Incarnation Of The Solar Architects). The Nine Colours Of The Threshold partially differs, in that it sonically bridges the earlier and later phases of the group, which is predominantly due to a calmer overall mood and slightly more abstract approach to composition than recent material. This means there are no immediate ‘hits’ to be found, such as was represented by earlier vocal led songs such as Chapel Perilious from The Crackling Of The Annonymous; or A Lefthanded Sign from The Incarnation Of The Solar Architects. Thus where vocals are present on this new album, they are used sparingly are spoken in a subdued proclamation style, but not delivered as a a song based lyric. To then clarify their chosen approach, the group themselves elaborated on this in a recent interview where they stated: “The title rises from the cosmos inspired by the visionary literature of the 1920s. There are links to G.Meyrink, H.P. Lovecraft, F. Strobl and P. Shou and many other occult authors of this era. Regarding the sound the album it is more electronic and calm than the precursor but there are always references to older sound resources combined with new technology. We even bought the same synthesizer we used during the recordings of the Aldebaran album and somehow the circle is closing again” (Inade interview published via Noise Receptor Journal – Issue No.5, October 2017). Sonically speaking The Nine Colours of the Threshold spans 9 tracks and 50 minutes length of refined mystic and ritualized soundscapes of the highest order, where meticulous detail has been paid to every element, no matter how minute. While recent material from the group has focused on a grand galactic scaled and mythologically infused sound sculptures, on this new album the feel is of an earth-bound perspective, seeming to articulate the universal spiritual yearning of the human condition in seeking truth and understanding at the abstract edges and limits of human consciousness. The second track Beyond All Thoughts and Entities arrives as being partially recognizable (as if something akin to a half remembered dream), where it transpires it a new studio version of a live track featured in live sets in recent years and known by its working title of Daahr *. To then reference perhaps the most directly song structured piece of the album, this comes on the form of the slow rhythmic beat driven structure and sub-orchestral drones of The Nethermost Chambers of Night, and and although a stunning track in its own right, without a central vocal line, it stops just short of fulfilling the ‘hit’ song role mentioned above. To also reference the groups comments of ‘closing the circle again’, this comes in the form of some some clear nods to earlier works, where the treated deep chanted vocals and drawling foghorns of The Pinions of the Sacred Time hark back to the use of the same elements during the mid to late 1990 period of composition **. The Lost Homeland is another highlight track located at the back of the album, which perfectly blends the now trademark elements of time stretching textures, slow cataclysmic tribal beats, sub-orchestral drones, monolithic foghorns and ominous treated vocals. Like any long established group, expectation can weigh heavily on any new release, and particularly so when nearly a decade has passed since of the last full length. 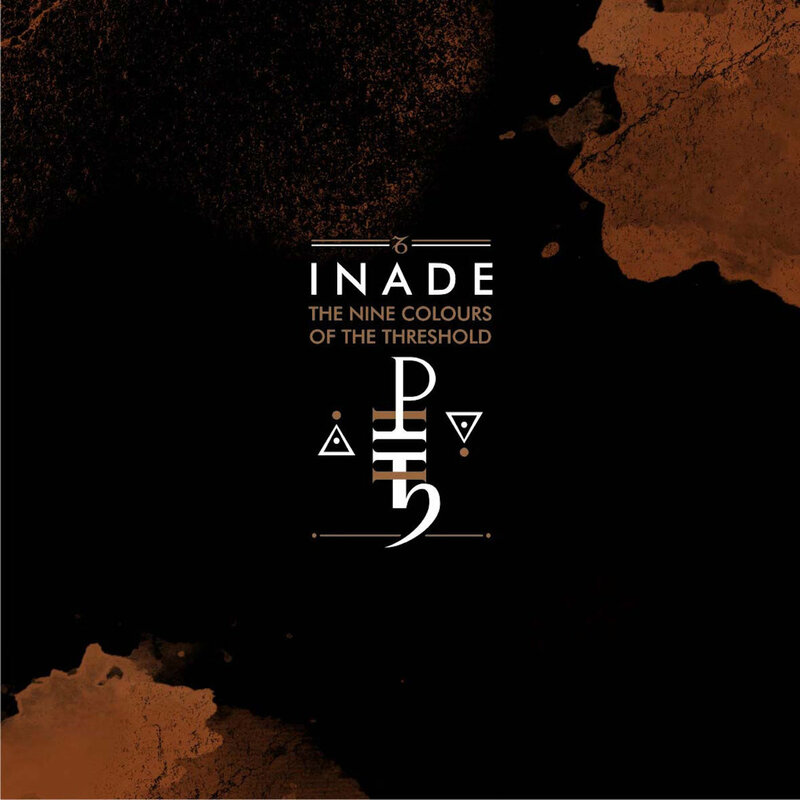 Yet at the same time Inade have never faltered, regardless of where they have chosen to push and evolve their sound within a ritual/ dark ambient framework. In this context The Nine Colours Of The Threshold is yet another release which absolutely meets expectations, and while there are not any immediate ‘hits’ which automatically stand out, it is a case where the album as a collective whole is more of a subtle slow burner, which reveals more vivid colours and variations the more it is appreciated. Nine years is a long time to wait, perhaps too long, but Inade have rewarded the faithful with another pinnacle addition to their illustrious canon. * – as featured on the Live At The Maschinenfest 2014 cassette. ** – as featured on the V.I.T.R.I.O.L. 7”ep from 1999, and on the bonus tracks included on the Burning Flesh CD reissue from 2000. Following the 2013 collaboration Nature Is Satan’s Church between these two American artists (reviewed here), the pairing have returned for another dual effort. The Icy Bleakness Of Things sits within a style broadly similar to the earlier collaboration given it features post-industrial tinged dark ambience, rather than the blend death industrial and power electronics which broadly characterises their solo output. 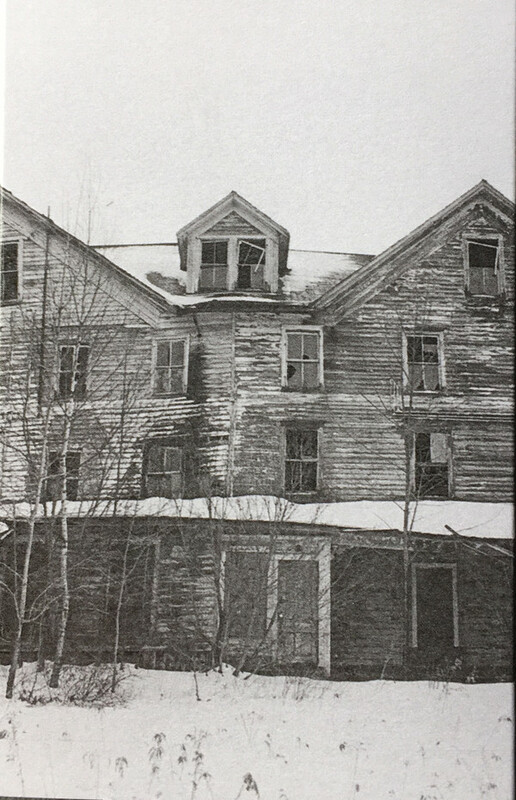 The Icy Bleakness Of Things features two 30 minute long track, with each spanning a side of the pro-duplicated tape. As might be suggested by the release title, the pacing is deathly slow, while the mood encapsulating a claustrophobic wintery melancholia. A maudlin minor keyed synth melody of the title track is soon relegated to the background with the introduction of a series of throbbing industrial pulses and muted electronic static, before settling down into thick cyclic bass driven drones and sub-orchestral loops. Side B brings The Killing Sadness, which distills the mood of the first side into more abstracted sonic spheres which more readily reflects the ‘isolationist ambient’ approach of Nature Is Satan’s Church. The sub-orchestral elements are also placed deep within the background which evokes a colossal spaciousness within the mix, prior to the reappearance of slow musical motif from and throbbing industrial pulses from the first track (but presented in slightly differing guises). As for the back half of the track, it variously encapsulates: a heavy section of ‘wind tunnel’ styles ambiance: reverb drenched lone guitar; and subtle doom drone textures. Generally speaking The Icy Bleakness Of Things is a fair a bit more animated than Nature Is Satan’s Church, yet is another high caliber and quite atypical release from this collaborative pairing. The physical edition comes in a mere 100 pro-duplicated copies, but digital download is also available. For whatever reason I did not order this tape immediately upon release, where the limited 200 copies then completely sold out in a matter of days. Given that Anenzephalia are an artist who could easily sell 500+ copies, I then consoled myself with an vague assumption that its limitation implied this collection of outtakes and unreleased material might have not been up to the same standard as other main releases. But in proving that assumption completely wrong it did not take long for word to filter out regarding how great the tape was, and after a bit of searching I managed to obtain the tape at a fair price. 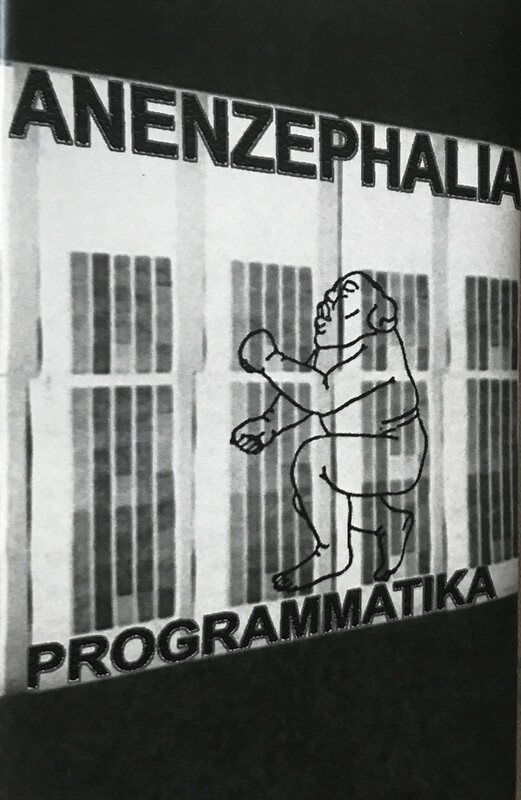 In now having had a chance to listen to the tape myself, in my estimation Programmatika features some of the strongest material from the project in years. Thematically Programmatika uses artwork and samples to cleverly comment on social engineering which seeks an idealistic Utopian future, but juxtaposes this against the creation of a soulless Dystopian nightmare. The tape features 18 listed tracks, which in reality each bleeds into a larger continuous composition. Sonically this perhaps sits towards the slightly more subdued sounds from the project post the year 2000, yet equally there is lots of sonic variety and detailing to maintain attention. According to the liner notes, all sounds were created 1989-2006 and further remastered 2016, however it seems that there are a variety of sonic elements which have been used in different formations on other releases. One of the most obvious of these is the clearly recognizable sample from A Tribute, featured on 1998’s mini LP New World Disorder. During a few select moments Programmatika features heavier industrialized textures, including atonal metallic clanging, swarming analogue distortion and queasy disorientating rhythms, but in the most part the mood is subdued and controlled. Likewise radio chatter and what sounds like German political speech samples occasionally bleed into the mix. Also of particular note, the end of Side B mirrors the first moments of the tape on Side A, while the end of Side A replicates the start of Side B. This functions to effectively create a conceptual ‘infinity loop’ of unchanging stasis, which would seem to represent the perpetual unchanging present without the possibility of a past or a future. To further frame the conceptual commentary, Programmatika is concludes with a deadpan voice repeatedly instructing the listener to “be happy”. Without doubt I have been extremely surprised by how strong Programmatika is as a complete and focused release, and in no way feels to have been cobbled together from outtakes or throwaway material. As such Programmatika deserves to be heard by more that the few hundred that a 200 copy edition without a digital version allows, so here is hoping that a repress will be issued at some point. Vinyl perhaps? Evidently Leila Abdul-Rauf is active in a number of other projects, including some underground metal bands, but as I am not familiar with any of those my only reference point is with her last album Insomnia from 2015 (reviewed here). 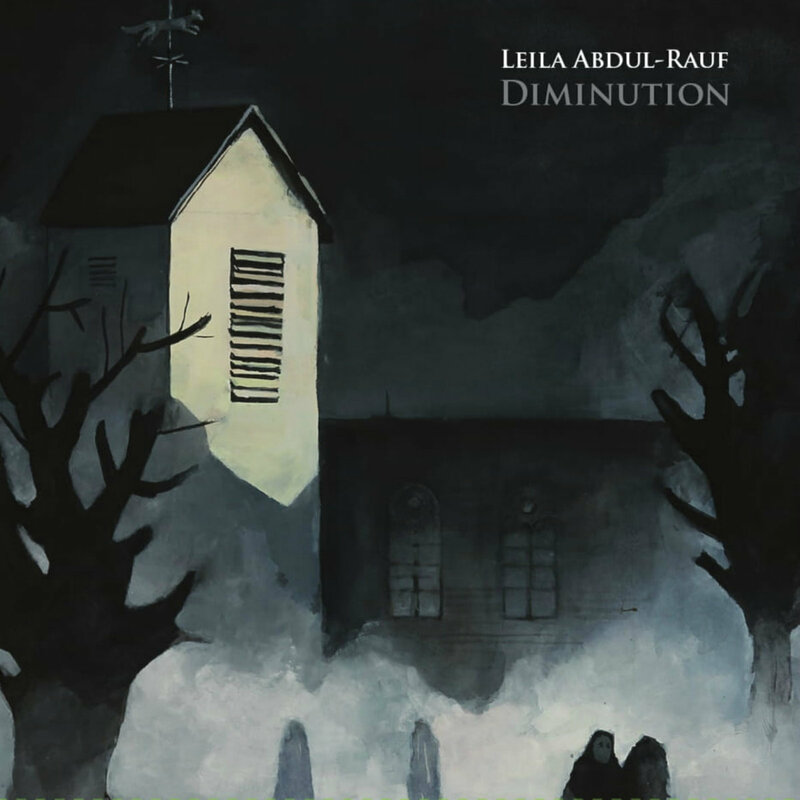 In building upon on the earlier sonic template, Leila’s new album Diminution can be considered through the definition of its title which amounts to: “the act, process, or an instance of becoming gradually less”. In this context, the dusky film noir atmospheres established on Insomnia have been further distilled down to a core, slighted abstracted emotional essence, although conversely a lengthier and at times song-tinged format has been employed. On the opening title track a sparse piano motif sits in the foreground, while a lone haunting trumpet plays off in the foggy distance, and thus with the evoked mood of late hours melancholia, this remains as the constant tone throughout the balance of the album. Half of the eight album tracks include vocals courtesy of Leila, but these remain understated and effectively float through the ether as another haunting textural element, and on occasion layered and multi-tracked for subtle choral effect. With the combination of vocals and music has an ethereal dreamlike quality, but always of a darker emotive hue rather than anything resembling a light or whimsical tone. Likewise the feel of abandoned and desolate nighttime urban streets remains an atmospheric constant (as represented by dour minor keyed synth washes) which blends perfectly with late-night jazz tone (derived from the sporadic lone trumpet playing), to create a deft film noir/ late night ‘Lynchian’ vibe. Late album track Hindsight deviates ever so slightly, through the introduction of a sparse and understated picked acoustic guitar, while final album track Light Rising concludes as a highlight in its convergence of elements described above, but delivered in a slightly more urgent musical framework. While the artwork in the form of an original painting by Matthew Jaffe would perhaps tend to suggest a more typical dark ambient album, this is far from the reality of what is musically presented, which is hauntingly eloquent in it chosen musical expression, where this album has been the perfect soundtrack to cold autumn nights (being the current Australian season in which the album is being reviewed). In taking the atmospheric mood of Insomnia and building upon it, Diminution stands above as a more impressive and emotionally impacting album. With the vinyl version being jointly issued by Cloister Recordings and Black Horizons, should CD be the preferred format, that is being handled by Malignant Records.